(APN) ATLANTA — On Thursday, December 14, 2017, the City of Atlanta dropped charges against activist Adele MacLean with Atlanta Food not Bombs related to her feeding homeless people in Downtown’s Hurt Park near Georgia State University. MacLean, who goes by the nicknames Dell and Earthworm, has been feeding homeless people in Atlanta for at least eight years. The City of Atlanta issued a citation to MacLean for purportedly violating state rules requiring a permit for “Temporary Food Service Establishments” on Nov. 19, 2017, in Hurt Park. The City issued a second citation on the same day to another unknown activist, MacLean told Atlanta Progressive News. Atlanta Food Not Bombs is trying to identify this person. “They never intended to prosecute anyone. It never occurred to anyone they will defy the cops,” MacLean said. Since the incident, police have been continuing to urge people not to feed homeless people, but have not been threatening arrest, Marlon Kautz of Atlanta Food Not Bombs told APN. “The very next Sunday we were out there with 200 people and there wasn’t any cops,” MacLean said. “What they want is to force the homeless out of the park, targeting anybody who’s making their life easier,” MacLean said. In recent weeks, Atlanta Police had been passing out flyers telling groups and organizations that they need a permit to feed homeless people, although Kautz says he believes the police have stopped distributing the flyers. Marshall Rancifer, a formerly homeless man turned advocate, tells Atlanta Progressive News that APD told him they got the flyers from Central Atlanta Progress (CAP) and the Atlanta Continuum of Care. “We sincerely thank you for your interest in serving Atlanta’s people in need. As providers of services to these groups 24/7, year-round, we are committed to helping them in ways that lead to changed lives and lasting self-sufficiency,” the flyer states. “In our experience, the best way to assist people in need is through places with sanitary kitchens, safe shelter, and services that help them address their problems and move forward with their lives. By contrast, feeding and donating to people on our streets is not a long term solution,” the flyer states. “We find that many people become dependent on these activities, leading them to stay on the streets instead of seeking the help and support that they truly need. Street feeding also pose public health risks for those being fed and sanitation problems for the City,” the flyer states. “Rather than feeding or donating to individuals on Atlanta’s streets, please consider directing your generosity to one of the great organizations working tirelessly to improve the lives of people in need in our communities,” the flyer states. In an embarrassment to the City of Atlanta, two out of three of the provisions cited in the flyer are invalid in that they literally do not exist. Fulton County Sec. 34-152 literally does not exist; it is currently a “Reserved” section, meaning it is reserved to one day possibly contain words. In addition, Georgia Comprehensive Rules and Regulations Rule 290-5-14 was repealed in 2013, as was correctly pointed out by State Rep. Park Cannon (D-Atlanta) at the November 20, 2017 Full Council Meeting of the Atlanta City Council. So, of the three ordinances cited in the flyer, only one is a valid, existing ordinance, but it is irrelevant to the case at hand. The citation issued by APD to Maclean cites as the alleged violation section 86-2. This is a City of Atlanta code section that incorporates Fulton County’s health regulations as the regulations of the portion of City of Atlanta in Fulton County. As explained above, Fulton County Code Section 34-152 doesn’t exist. Meanwhile, State of Georgia Rule 511-6-1.08(2)(b)(3) applies to Temporary Food Service Providers, and does not appear apply to private citizens feeding homeless people. Private citizens are not operating a food service establishment; they are giving food away as part of their humanitarian and charitable ministries to the less fortunate. The Rule defines a Temporary Food Service Establishment as: “a food service establishment that operates at the same location for a period of no more than 14 consecutive days in conjunction with a single event or celebration.” (2)(a)(1). Further language of the Rule makes it clear, also, that distribution of food for sale as a profit-generated activity is intended, by repeated use of the term “vendor.” (2)(a)(4)(i), (ii), (iii). “The fact that the public is feeding the homeless out of our own pockets, maybe it makes the city look bad and that is why they want to crack down on us. Taking away people’s human rights to eat is not the way to deal with that public relations problem,” MacLean said. MacLean accuses the City of not taking care of homeless people and trying to hide them out of sight or in jail, so it looks like the problem is solved. “They don’t want homeless people around where rich people have to see them and be uncomfortable,” she said. The reason that some homeless people don’t go into shelters is because of their policies, including taking people’s cell phones and personal items away at the door; and requiring residents to be in at a certain time and leave at a certain time, which eliminates the ability to work many jobs, Rancifer said. “The only place unsheltered homeless people can get a meal on the weekend is at Immaculate Conception and First Presbyterian Church in Midtown on Sunday morning from 6 a.m. to 8 a.m.,” Rancifer said. Most folks would go hungry if not for citizens who feed homeless people on the weekend at Hurt and Woodruff parks and other locations around town, he said. “They say people like myself are the problem for feeding in the park, but I don’t think there would be hundreds of people here if they were not hungry,” LaCrisha Saba, a volunteer With Love Global and the 2017 Mrs.Georgia America, told APN during a recent feeding. On November 11, 2017, Atlanta Police turned away With Love Global and said they could not feed homeless people without a permit. 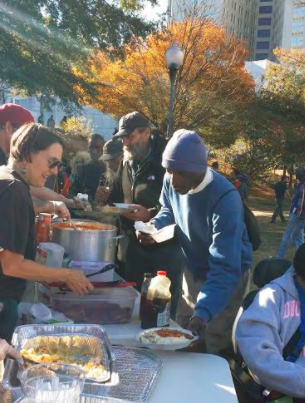 With Love Global, in fact, got a permit–even though it may not have legally been required–and they came back on November 26 with a huge Thanksgiving dinner for hundreds of homeless people in Hurt Park. Afterwards, they cleaned up all the litter the City is so concerned about. Others observed that the City is not as concerned about litter from sporting events and festivals. For the November 26 feeding in Hurt Park, several attorneys, Cop Watch, and television cameras were present to document if any people were fined or arrested. Food Not Bombs and With Love Global came back and fed homeless people without police interference or threats of citations. “You would think there would not be homeless people out on the streets since they legislated homelessness out of existence when they closed Peachtree & Pine shelter. You would think they had solved the problem,” Bert Bender sarcastically said while he passed out personal care products at Hurt Park.